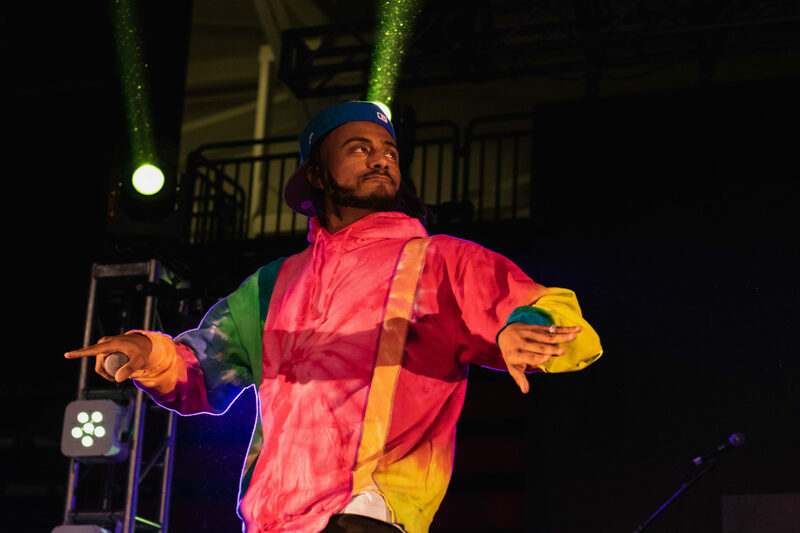 Stony Brook University’s annual spring concert introduced this year’s crowd to the openers Lil Skies, Aminé and headliner A$AP Ferg at the Island Federal Credit Union Arena on April 11. For the first time ever, the Undergraduate Student Government (USG) opened an online ticketing system that gave students the option of purchasing tickets without visiting the SAC ticket office. There was also the opportunity to win a Brookfest VIP experience guaranteeing six students and their guests suite access and a swag bag brought by Metro by T-Mobile. In an effort to further motivate students, alumni and their guests to buy tickets for Brookfest, USG members held different times throughout the week to give away T-shirts to those with tickets. Before doors opened at 6:30 p.m., a line of enthusiastic fans emerged from all over campus. When early attendees were asked about the choice of lineup, some weren’t too familiar with the artists. Recent Stony Brook graduate and DJ for the night, Sana Fujimura, warmed upthe crowd with a variety of mixes that kept everyone moving in between the main performer’s sets. After DJing for past events such as Wolfieland and Roth Regatta, she performed for the first time on the Brookfest stage. Once Lil Skies set foot on stage, the energy in the entire arena skyrocketed. Fans matched his spirit as he jumped from one side to the other while also leaving the stage to get up close and personal with those behind the barricades. In the middle of his set, he took a moment to autograph a hand-drawn picture junior health science major Fawaad Javaid had with him in the front row. Lil Skies played popular tracks including “i,” “Nowadays” and “Stop The Madness” from his most recent releases “Shelby” and “Life of a Dark Rose.” He also stopped to share some motivation and speak about his college experience. Both Aminé and A$AP Ferg took a moment to honor Nipsey Hussle, a Los Angeles-based rapper, songwriter, entrepreneur and community activist who died due to gun violence on March 31. Founder of A$AP Mob and New York rapper A$AP Yams was also honored that night. “In one two three, say ‘Rest In Peace A$AP Yams’” A$AP Ferg yelled. A$AP Ferg performed a mix of his songs trailing back to his popular 2013 song “Shabba” from the album “Trap Lord.”His mix included “Plain Jane,” “New Level” and “Trap and a Dream.” He sprayed the crowd with water after asking if they’ve ever been to one of his shows and if not, then they were in for a big surprise. After a few songs, he left the stage to sing with the fans in the stands area. The mosh pits, memorable performances and close interactions with the artists made this an enjoyable Brookfest for the students, who kept jumping along with the rappers and singing along to their songs. As rap artists continue climbing the charts and new artists emerge from popular streaming platforms such as Soundcloud and Spotify every day, fans are stuck trying to play catch-up and know who’s who. It’s impossible not to appreciate the wave of rap artists and how quickly the genre has expanded, even for those students who didn’t particularly know who Lil Skies, Aminé or A$AP Ferg were before the concert.